Welcome to the forestry wonderland of Douglas Bluff located in Sevierville, Tennessee. While in the area we at SMBYO.com suggest you check out Adventure Park Ziplines for a truly exhilarating experience. This company has ziplines for all ages whether you’re with small children or a group of adults, Adventure Park Ziplines has you covered. Adventure Park also offers guided horseback rides through hiking trails. There is debatably no better way to experience the serenity of nature than to traverse a hiking trail on horseback! We also recommend that you check out the ancient Forbidden Caverns while you’re in the area. The beginning of the cavern tour starts with a light show in the cavern walls and a brief audio explanation of how the Ancient Indian Tribes used and named the caves. Douglas Bluff is also located in proximity to the famous Dollywood Amusement Park. The park boasts a large variety of thrill rides and puts on multiple live performances daily. Dollywood has been a staple of this Tennessee community and the surrounding areas for many years. 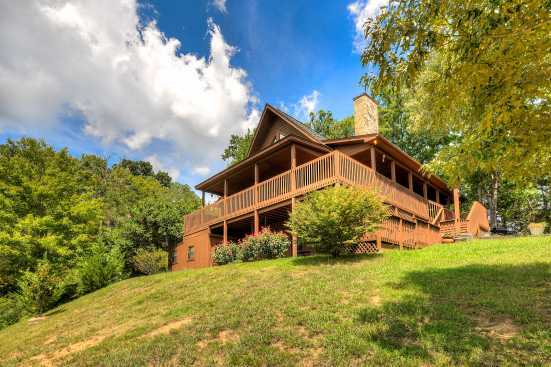 Smokymountainsbyowners.com is the best and most efficient way to find, plan, and book your Douglas Bluff vacation in Tennessee. From Adventure Park Ziplines to the Forbidden Caverns and the famous Dollywood Amusement Park, guests of all ages are sure to have an amazing time! SMBYO.com aims to take the hassle and stress out of planning and booking your vacation rental property, so all you must do is decide which adventure you would like to go on first! Book now, and we’ll catch you soaring high above the trees on a zip line! Whoosh!